My brother-in-law Jim recently left his congregation in Olathe, Kansas to take a parish in Stillwater, Oklahoma. Clearly he displeased God because God punished Oklahoma with tornados. God did not unleash the tornados on Oklahoma. It wasn't a punishment, it wasn't God's will, nor were the tornados part of some design plan. I haven't heard anyone seriously blame the tornados on gay marriage, Moslems or evolution in schools yet (perhaps because it was Oklahoma or there were so many children involved), but, sooner or later, it's bound to happen. This is Old Testament thinking. As a Baptist Preacher's Kid (BPK), I was raised to believe Old Testament thinking is New Testament thinking. After all, the Bible is the Bible and every word is literally true (even when Paul says something is symbolic, by the fact that it's in the Bible, it ceases to be symbolic). And Jesus said he didn't come to replace the law but to fulfill it. When we fall back on that statement, we overlook the fact that the law is a small part of the Old Testament. Three books, minus the narrative. “The Law” in the Bible was actually a reference to the Torah, which was the first five books of the Old Testament. So when Jesus said he came to fulfill the law, he was only referring to the law itself, not the Old Testament, which Paul said was given to us for example and instruction. More importantly, when Jesus said he came to fulfill the law he meant he came to change the way we think about the law; how we understand it. In the Torah, the law was an external code. We obeyed it because an authority told us too. Jesus taught us the law is something written in our hearts. We don't need a written code as a literal map for our lives, we follow what we know to be true inside after following Jesus. God doesn't use nature to target people. He doesn't need to. We're good enough at targeting people ourselves. As Christians, our response to disaster shouldn't be to point the finger but to serve. We can serve the victims of disaster if we can, or, we should find opportunities to serve others every day. We should do this whether or not disaster occurs. Thank The Lord for elected judges in Texas, one of whom recently held that Christian cheerleaders can display Bible verses at school games because such displays don't violate the establishment clause of the US Constitution. It is especially comforting to know that state elected officials can rule on the US Constitution, otherwise our freedoms could be in jeopardy. The school didn't ask for the right to display the banners. The Kountze High School cheerleaders did, thanks to the help of the Liberty Institute, who sues any institution who dares suggest that some Americans have the right to avoid Jesus' message of love and tolerance by not attending church. After all, just because you don't believe, it doesn't mean you don't have to listen. That's what free speech is about. Judge Thomas agreed, buying the Liberty lawyer's argument that since the cheerleaders paid for their own equipment and signs, they didn't represent the school. It's not as though they were appearing at a school sponsored event, transported there by school financed buses driven by school employees. Free speech is free speech, and we can never ignore Jesus' injunction to do to others what we would want them to do to us. And we would certainly want others to spread the good news. 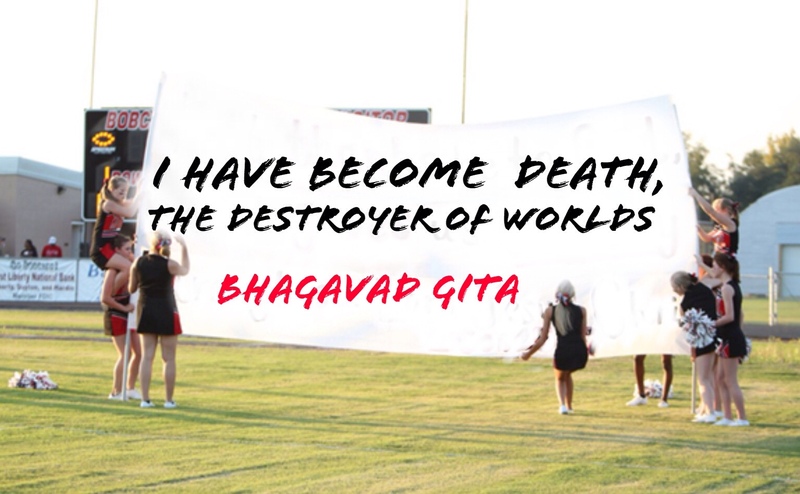 Nor can I imagine the cheerleaders, or any of the school's supporters, would be upset if one of the cheerleaders, or a football player, or even a fan displayed banners with passages from the Koran, Bhagavad Gita or Communist Manifesto. Just because someone says it doesn't mean we have to listen. That's what free speech is all about. And if we want to do unto others as we would have them do, then doesn't asking others to listen to verses from the Bible mean we want to listen to passages from their scriptures as well? In America, we've buried the bodies of mass murderers and serial killers without compunction. We've done so for centuries. We even buried the bodies of spies, such as the Rosenbergs (even though evidence now exists that Ethel may have been innocent) and even traitors like Benedict Arnold. We buried Jeffrey Dahmer, John Wayne Gacey, Ed Gein, Albert de Salvo and Ted Bundy. We buried Timothy McVeiigh, who was executed for the murder of eleven civilians and who leveled a federal building. We even buried the Haymarket bombers, without protest, even though their body count included seven policemen. We're even willing to bury radioactive nuclear waste. Suddenly, however, we can't bury Tamerlan Tsarnaev, whose crimes were heinous but who ranks at the bottom of the list for heinousness. Except, perhaps, for the fact that he's Muslim. And Chechen. Murder is forgivable. Being foreign and Muslim is not. Enter Martha Mullen, who volunteered to work with Moslem groups in Virginia to find a cemetery for the body. Her motivation? Jesus. She parallels her actions on the parable of the Good Samaritan. Most people forget, of course, the irony of the parable. It wasn't the believer who was the good guy. The believers were assholes. They were perfectly willing to let a stranger die. The unbeliever was upheld as a model of (what would become) Christian virtues. The response has not been Christian. The County Board of Supervisors is threatening to investigate any illegality and promising to undo the burial if they find it. My favorite was a local resident who was afraid people would come visit the grave and “you don't know what they'll do while they're here.” Why, they might even leave flowers. I applaud her. As Jesus said, our love is demonstrated by how we treat our enemies. It is easy to love our friends.